"I am shocked and deeply distressed by the apparently deliberate targeting by Israeli Defence Forces of a UN Observer post in southern Lebanon." "He went too far for the seasoned diplomat that he is. "I think that his statement was irresponsible, unfortunate and deplorable." Really? Well most of us around the world regard Israel's actions in Lebanon as "irresponsible, unfortunate and deplorable". I can't quite believe how Israel has managed to get away with a foreign policy that amounts to nothing more than bullying through bombardment. 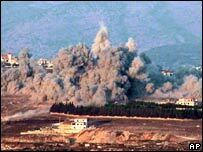 As the bombs rain down in Lebanon causing deafening destruction, major powers such as the United States and Britain have stayed sickeningly silent. The United States preaches equality and declares that it is "self-evident" that "all men are created equal" yet here they turn their backs on the men, women and children of Lebanon being murdered by the savagery of Ehud Olmert's Israel. Britain meanwhile, which knows the horror of air raids on civilians all too well, likewise turns a blind eye to the suffering endured by the Lebanese. The Israelis have targeted civilians and now they have targeted UN peacekeepers. What moral boundary do these murdering scumbags have to cross before the international community will gather the courage to stand up to these bullies and say "no more"? Stop this murder. Stop Israel.